All our products protect your display from scratches and abrasion. Displays need to be protected, either those made of Corning Gorilla glass or made of plastic. The differences in quality depend of the hardness and resistance to abrasion. Protect your display and preserve the value of your device. We help you to take the right choice. Everybody has suffered it. You look at your screen and only see your own reflection. The reason are light sources, either from the sun, or office or industry lights. Also when you are ourdoors is glare very disturbing. To prevent these light reflections we offer several materials. Most of them have a matte surface. Our screens show personal photos and confidential information such as finance information from the bank or customer data. Therefore there is a high risk that this information can be seen from unwanted viewers. With our privacy protection products you make sure confidentiality remains. On your notebook during a train trip or at the working station at the doctor´s office. Did you know that your device is a source of bacterial infection? Your device may look clean but germs are transferred daily to displays, causing them to carry more bacteria than an average toilet seat. Normal cleaning of your display doesn´t remove these bacteria unfortunately. Through your fingers or through direct contact of your device with your skin, these bacteria can transfer to your face, mouth or nose, causing infections. With precision-matched material properties with regard to surface finish, scratch resistance, adhesive and installation properties we offer the best protection for your individual needs. Under the Bedifol Premium brand upscreen® we offer the most innovative products in best quality. Under the Bedifol own brand Brotect® we offer high quality products at fair prices. 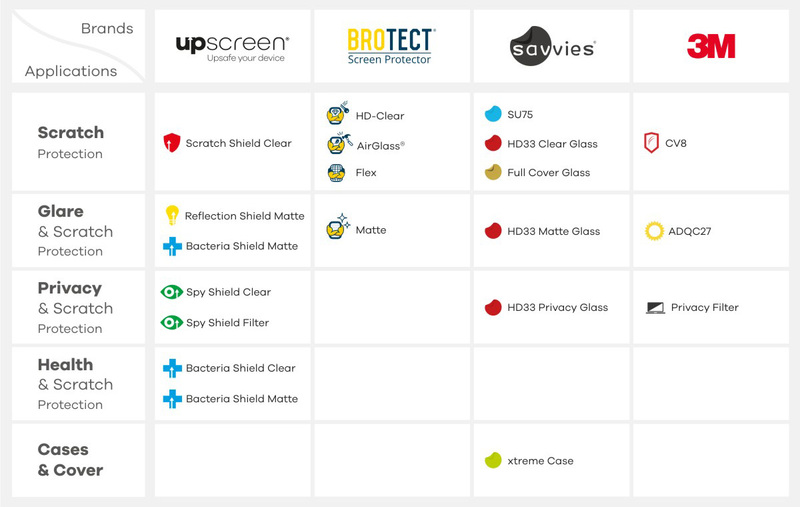 We are authorised Partner for the 3M Vikuiti™ screen protection program since over 10 years. Under the Bedifol own brand savvies® we offer entry-level products to reasonable prices.